Slip and fall accidents fall under premises liability and are the most common reason behind these claims. They can lead to severe injury and may be caused by the unintentional or willful negligence of the property owner. Slip and fall lawsuits take extensive documentation and time, which could leave you with stacks of medical bills in the meantime. That’s where we come in. Legal Capital Corp can give you a slip and fall case cash advance, so you don’t have to wait to move on from the accident and your injuries. Premises liability cases must prove that the property owner was negligent in one of several ways such as neglecting his or her duty to warn or protect you or a loved one and that action or inaction led to your injuries. 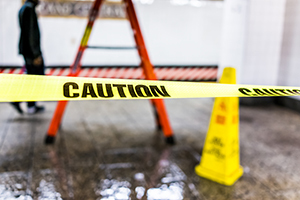 Slip and fall accidents may be caused by structural defects due to improper construction, trip hazards such as spills, cracked sidewalks, or exposed cords, or weather hazards. When it comes to snow and ice, the property owner has a duty to shovel and address the danger to prevent slip and falls from occurring. You and your attorney will need to prove negligence in order to win your settlement, but our cash advance might be able to help you until then. Economic Damages: These are the most common reparations for personal injury claims. Economic damages compensate you, the injured victim, for actual sums of money lost. That involves medical expenses such as ambulance and ER bills, physical therapy, in-home care, as well as property damages. This amount is calculated using receipts, invoices, hospital bills, and all other documentation that shows you and your family paid these costs. If you’re found to be partially or equally at fault for your slip and fall accident, your total could be reduced. There’s no cap on economic damages in the State of Illinois. Non-Economic Damages: Non-economic compensation is less specific and aims to reimburse you for what you spent out of pocket due to the injury and other losses you’ve suffered such as disability, disfigurement, lowered quality of life, and pain and suffering. These are more difficult to put a number on, so it’s highly subjective and varies case by case. There’s no cap on non-economic damages in Illinois either. Punitive Damages: These are designed to punish the defendant who has been found to commit an appalling act. Punitive damages are rarely awarded, but when they are, they’re typically related to personal injury cases including slip and falls where the property owner was reckless and/or negligent in caring for the premises. This compensation is given on top of the compensatory damages listed above. If you or a loved one has been injured in an accident and are awaiting settlement with your insurance company and attorney, call us in Chicago today at (312) 204-7939 or fill out our online form to see if you’re approved for a lawsuit cash advance. Legal Capital Corp offers FREE QUOTES and bilingual services to clients in Chicago, Illinois and nationwide.